Would you believe an estimated 1 million animals are killed on the country’s 4 million miles of public roads every day? In addition to the cost of animal life, the Federal Highway Administration estimates these accidents result in about $8 billion in damages each year. That’s some pricey roadkill. And the cost to human life? The Insurance Institute for Highway Safety estimates about 200 people are killed each year in accidents with deer and other large animals. To avoid loss of life and expensive damage to your vehicle, it’s important to understand how to drive safely around, through and near animal life in your neck of the woods. Here are a few tips from Animals 24-7 on when you should slow down, proceed carefully, drive around and stop completely for wildlife on the road. If you see something a dog might chase (a ball, child, cat, squirrel, etc. ), slow down and watch out for a dog nearby. If you see roadkill, keep in mind that other critters may be feeding on the dead animal, and slow down. If you see a deer off to the side of the road, slow down. Where there is one deer, there are likely others nearby. If approaching a low-flying bird, do not brake abruptly. Slow the car gently, allowing air lift to raise the bird above the car or for it to peel off to the side. Some animals such as raccoons, skunks and porcupines prefer to mind their own business, and if they don’t feel threatened they will likely let you cruise on by. Avoid slamming on the brakes or accelerating; just proceed carefully around these critters. Some creatures are slow enough that, once identified in the road, they can be slowly driven around. If you see an armadillo, beaver, frog or turtle, slow down and carefully drive around these creatures that typically freeze when they see headlights or can’t move quickly out of the way of a moving vehicle. Drive around and not over these critters — armadillos can jump! If you see a large animal or a herd, stop your car completely until the road is clear. Collisions with large animals can be fatal to a driver and passenger. Herds of cattle and bison will likely stand their ground, and you can slowly navigate around them, but horses, elk and moose may be harder to anticipate. Flash your lights or honk your horn to encourage them to move along, or simply wait for animals to move. Once they’ve moved, proceed with caution. If you see a large mass in the road and you’re in bear country, slow down or stop completely until you can positively identify the obstruction. It could be a mama bear with small cubs in tow. Stop completely for rabbits (which tend to run around in circles) and small creatures like squirrels and chipmunks, which zigzag and dart. The best way to avoid these critters is to stop and wait for them to move out of the way of the vehicle. 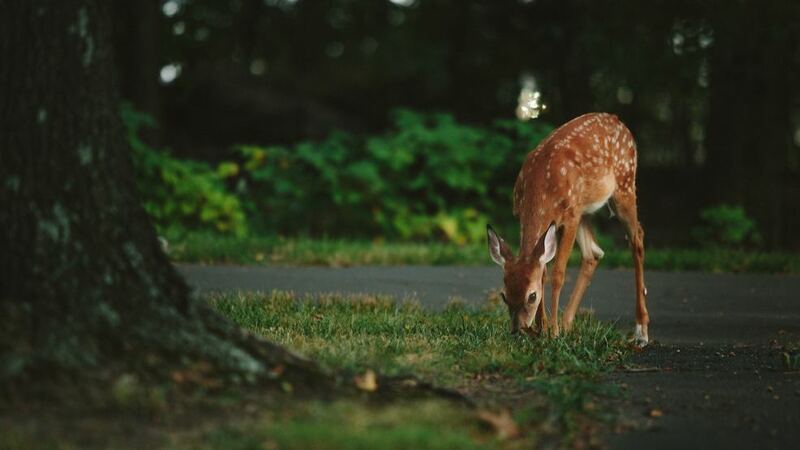 As general safety tips, Defenders of Wildlife recommends being alert when driving in wildlife areas — wooded, wetland or agricultural areas and wherever roads cross streams. Actively scan both sides of the road and ask passengers to help you keep an eye out for animals. Avoid distracted driving, and, as always, make sure you and your passengers are wearing seat belts.